Council names rare plant to be Nanaimo’s official floral emblem. 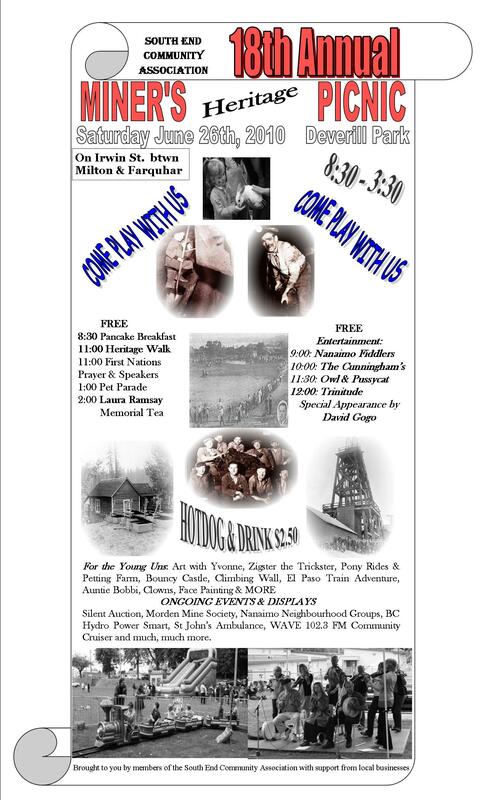 Well, the BIG news for us is the 18th Annual Miner’s Heritage Picnic on June 26. See post below for the details. As well, check out below for info on the Neighbourhood Plan Open House on Thursday June 17. You may have noticed that this lot is transforming and your neighbours are working hard to produce their own food and make a neglected property beautiful and productive. A big thank you to Holland, Darren, Kevin, Lance and Tim who took an idea discussed at a neighbourhood meeting and just started working! If you want to grow something at your Community Garden – it’s simple – come and claim a plot and start growing! Flowers, herbs and veggies are welcome! Bring Shovels and Forks If You Have Them for the Work Party!! Pretty soon you’ll see the poster springing up around the neighbourhood! It has the SCHEDULE for the day and a list of some of the events and activities. And we’re looking to outfit it for some summer community gatherings. Do you have any extra plates (large or small), cutlery, and teacups/saucers that you would be willing to donate? or even a teapot? If so, bring them along to the picnic and we will thank you profusely…!